In August of last year, I rather bizarrely found myself looking out the window at my boyfriend, Jared, as he carefully carried a package of tubes of my still-warm blood. He was about to hand them over to a FedEx courier who would be sending them on their way to ArminLabs in Germany. For the last few years, I had been very ill with a wide range of symptoms which had turned my life entirely on its head. I had gone from being physically active and working in a busy job to predominantly housebound and reliant on others to help me with all aspects of daily living. I had been given a diagnosis of ME / CFS (by a process of elimination) and had pretty much exhausted the NHS services available to me. I was told that there was no medication that could help me and that from there on in it would be a case of managing my symptoms as best as possible. Frustrated, I looked for more answers. My symptoms to date have included debilitating fatigue; muscular and joint pain; migraines; memory problems; word-finding and concentration difficulties; weakness; poor temperature regulation; numbness; dizziness; nausea; muscle twitching; anxiety; light and noise sensitivity; sleep disturbance and painful swollen glands. I learned through my research that while these symptoms do fit with a diagnosis of ME / CFS, they can also point to, among other things, Lyme Disease, an illness caused by a bacterial infection (Borrelia burgdorferi) transmitted via the bites of infected ticks. This information about the transmission of the illness set some alarm bells ringing in my mind. Five years earlier, I had travelled in Thailand and while trekking in the jungle amassed a couple of large, red, suspicious looking bites on my leg which were more pronounced than mosquito bites covering my body. When I returned to the UK these bites did not go down and I fell very ill. I was sent by my GP to hospital for testing, Malaria being the main suspect despite the antimalarials I had taken. After a week or so though, I started to feel better and further investigations were abandoned. As a result we never got to the bottom of what had caused the sudden onset of my mystery illness. I later moved to the Isle of Lewis in the Outer Hebrides where my boyfriend and I got a puppy. We were frequently out walking in tick prone areas and it was not uncommon for me to remove ticks from my dog when I found them on his skin. For a long time I dismissed my potential exposure to ticks as I had I asked on a number of occasions that my GP test me for Lyme Disease. I received two negative results. I also enquired about a referral to Infectious Diseases at an ME/CFS service appointment but was informed that there was not a lot of point as I already had negative Lyme results. I later learned though that despite what I had been told, a negative NHS test result cannot conclusively rule out Lyme Disease. With a sensitivity of around 50%, approximately half of positive cases may not be identified. It also came to my attention that many people with Lyme disease do not remember being bitten by a tick or present with the 'typical' Lyme rash (erythema migrans) I had seen on the NHS website. My immediate reaction to my findings was that I had to get more accurate testing straight away. It quickly became apparent though that nothing Lyme Disease-related was going to be straightforward. For one thing, trying to find out more about the illness itself was like opening a can of worms. There is an overwhelming amount of information out there, a lot of which is emotionally charged and conflicting. If I'm entirely honest, even after wading through huge amounts of information, talking to health professionals and reading books, I still do not feel I could talk about it confidently or definitively. It also became clear that private testing would be expensive and that even if a positive result did come back accessing treatment would be difficult. Personally, I did not have the money for private testing readily at my disposal so I would be reliant on my parents to fund this for me. I worried a great deal about the expense and their money going to waste. For this reason, it was important to me that we worked out where the very best lab would be. With the help of my friend Sophia's mum, we identified ArminLabs in Germany as being the mostly likely reliable place to have the testing carried out. They offer Seraspot and ELISA tests (similar to NHS) which look for antibodies the body has produced against Lyme disease. They also offer an entirely different test, the EliSpot, which tests for T-cells. When the body detects a Borrelia (Lyme) infection, the immune system, as well as antibodies, can produce T-lymphocytes. Once the Lyme infection is no longer active, the T-cellular immune response should vanish. Therefore if Lyme specific T-Cells are found in the blood this would indicate an active Lyme infection. ArminLabs assert on their website that the EliSpot test has a sensitivity of 84% (84% true positive rate) and a specificity of 94% (94% true negative rate). Numbers which are significantly higher than those for the NHS tests. We decided, in light of any evidence to the contrary, to take these figures at face value. After umm-ing got and ahh-ing for a long time, I finally decided that my doubts around testing were outweighed by the potential positive outcomes. If I received a negative result, nothing would change. I would carry on managing my symptoms as best I could and I would have eased the niggling worry in the back of my mind. One of my biggest fears is finding out years later that there was something I could have done sooner to improve my health. If I received a positive result and was to take it at face value, there would be the potential for attempting some kind of treatment. It may be stressful and confusing and I'd have a lot to learn but it could also help me get closer to feeling better in the long run. There would be no guarantees of improvement but I'd have something to investigate and work towards. Having made the decision, we set the ball rolling by following Karen's step-by-step guide on Sophia's blog. 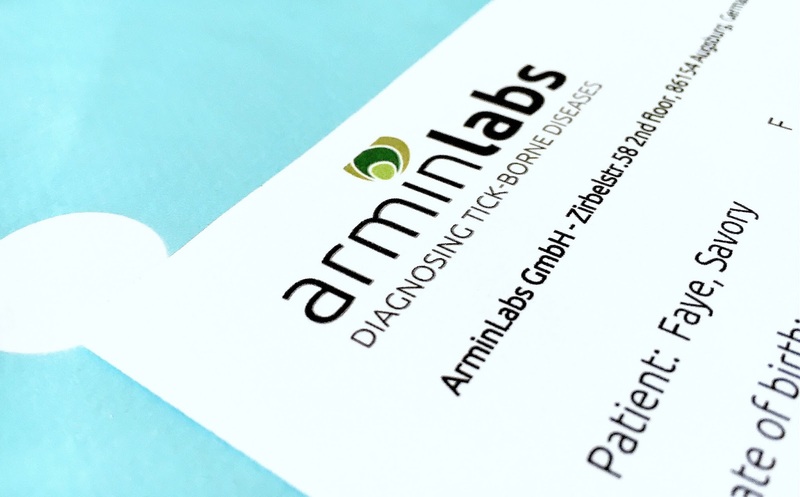 We decided to have tests done for Lyme and a number of co-infections (as recommended by ArminLabs on the basis of my symptoms). In total this cost around £700. A nurse at my local GP surgery took my bloods and a courier sent them on their way to Germany. I received my results a few weeks later via email. The results were not the easiest to interpret so I sought help from the Lyme Disease UK Discussion Group. My Lyme seraspot results were negative but my EliSpot was (quite strongly) positive. I also had positive results for several co-infections. Something I have worried about a lot when writing this blog post is that I share the most accurate information that I can. I have tried to read widely and critically but am very aware that there are still gaping holes in my knowledge and understanding. I wanted to share what I could of my own experiences in case they could be of help to others but am by no means an expert. I'd like to carry on documenting how I get on with everything Lyme-related and hope to share posts as and when I can about the (limited) treatment I have been able to access on the NHS. I have tried a fair amount to find information on specificity and sensitivity of the diagnostic tests and they are not readily available in the peer-reviewed literature. Even the links you shared that are published have very low sample numbers! This problem creates a major problem unfortunately. If you cannot diagnose people you think there are not many people with it therefore you spend less on research and treatment. The system assumes you can readily diagnose things! Thank you for posting this! As I have questioned whether in fact I have lyme for past 2 years since being diagnosed with MS. The consultants (in NHS) have refused to test for it, despite me telling them I had been bitten by a tick when I was younger in Germany. Plus I have all the symptoms more so than MS, as I have arthritis and joint pains and chronic lower back pain since I was 21. Which they say themselves joint problems are not related to MS. Testing for Lyme disease is meant to be one of the first things in the NHS guidelines for diagnosing MS to rule it out first. So you should already have been tested. Family member recently went through 2 years trying to get her MS diagnosis. Worth looking up the guidelines and quoting them to your docs to make sure they test you. Good luck with it! I just returned from a trip to Germany to get tested for borreliosi and bartonella. Well done for doing a great job in explaining such a complex issue Faye. The first indication there might be a new species of Lyme disease-causing bacteria was unusual lab test results from six samples from people suspected to have the illness. Further genetic testing at the CDC and the Mayo Clinic in Rochester, Minn. pinpointed the new species of bacteria,revealed, quoting the research. I just sent my blood to Germany through my naturopath! In Canada, the health care team does not recognize tick diseases what so ever. I have seen multiple doctors and they have all said something different. I have MS, or Chrohn's Disease ect. So excited to find out my results! Online Pharmacies spares you cash on Baby Products. You can get diapers, moisturizers, cleanser, medication, https://tadalafilgen.com/ nursing packs, child equation all at rebate costs.